While there is plenty of speculation that this will be the week we experience a flash crash, I don't think it's likely. And, if it should happen, it won't be the market disaster that many expect -- for the simple reason that such severe drops almost always retrace significantly in a relatively short amount of time. In my opinion, we've completed wave 1 of (1) of P down and are in the process of tracing out corrective wave 2, which should take us back to the midline of the channel created over the past four months. This is a count similar to 2007's, in which there was also dissension over the initial impulse wave count. That midline currently stands around 1324 or so. The simple average of the most recent high (1370) and low (1258) is 1314; but, I've been more focused on a broadening channel running roughly parallel to a simple regression channel with boundaries of +/- 2 standard deviations. 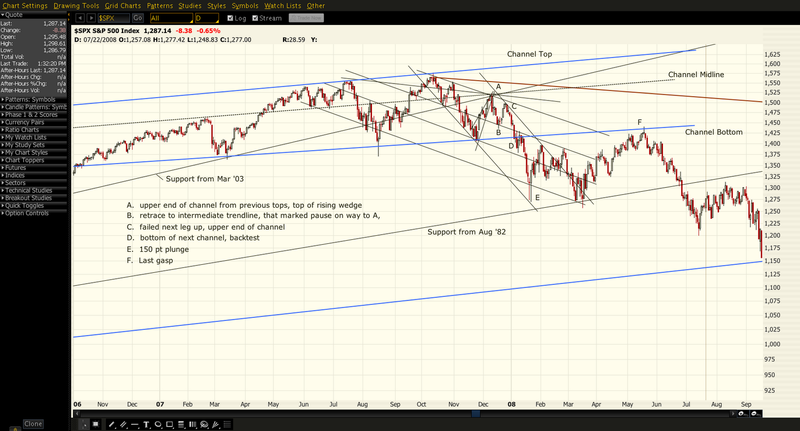 My channel is drawn off significant highs leading up to the current pattern and is explained here. After the 10/11/2007 peak, that market dropped 10.8% in 31 days. It then recovered to its channel midline in just 11 days. This represented a price retracement of 68.8% in 35.5% of the time it took to reach its low. These numbers are very consistent with other significant declines. I looked at market drops since 1987. I started with the crash of August 1987 and worked my way forward, setting a threshold of a minimum 7% drop within 35 trading days or so. 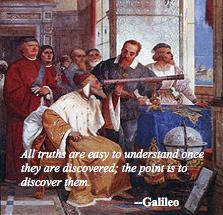 I chose the time periods in a rather unscientific way -- I eyeballed them. It's quite possible I missed some or included some that shouldn't have been, but the results were fairly consistent. As can be clearly seen, the minimum retracement of one of these significant declines was 35%. The average was 56% -- which supports my assertion that markets tend to retrace to their midline before leaving the topping pattern. 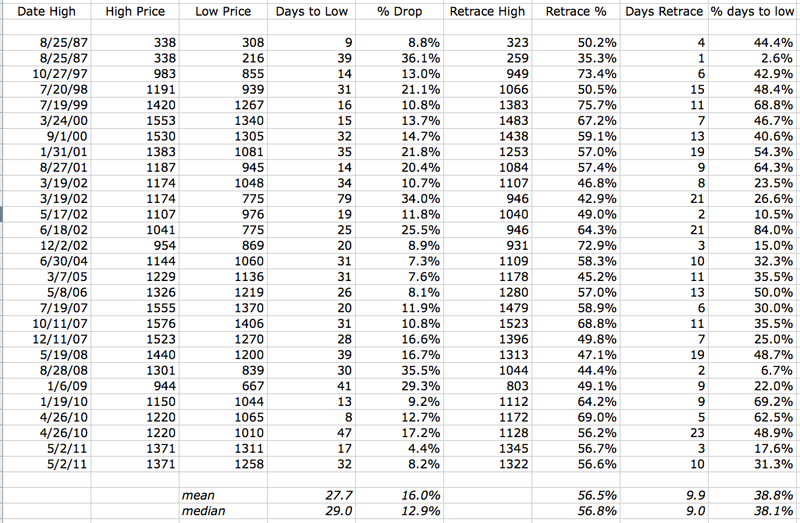 Viewed from a Fibonacci standpoint, the most common retracements were 50% (12), 61.8% (11), 78.6% (3) and 38.2% (2). The average retracement time was 38% of the time it took to decline in the first place. The frequency of common Fib's was 50% (9), 38.2% (7) and 61.8% (4). Like the price retracements, this jibes with common perceptions about market moves in general. If 1258 was indeed the low, the decline we've seen since May 2 took 32 days -- very much in keeping with the study averages. In those 32 days, this market lost 8.2% -- a little on the low side, but within the study range. If we perform per the historical averages, the market will retrace to its midline of 1322 within 12 days -- or, July 5. 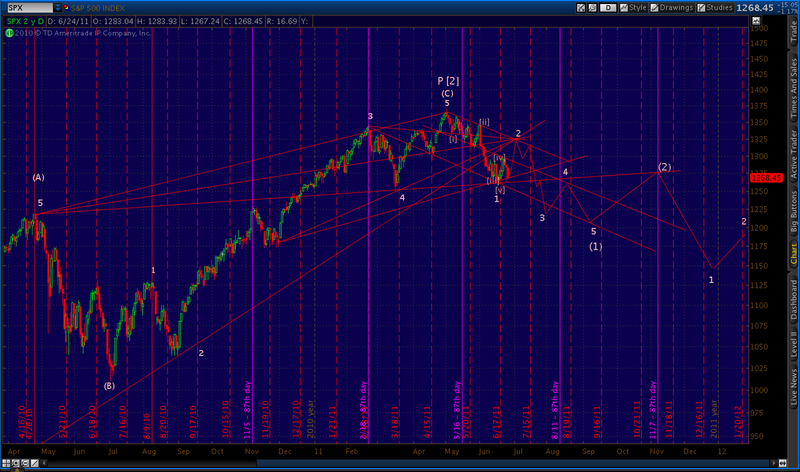 My own charting -- based on comparisons to 2007 -- indicates Friday the 1st, which would be 11 days. Pretty close. 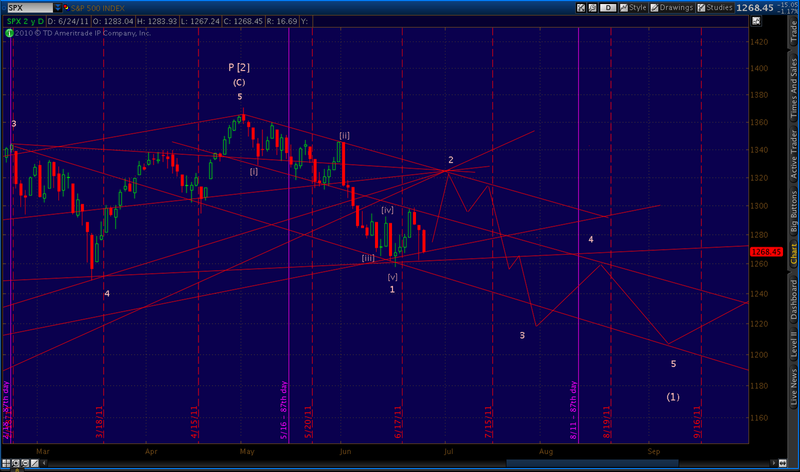 My price target of 1324 is also pretty close to the 1322 the study indicates. 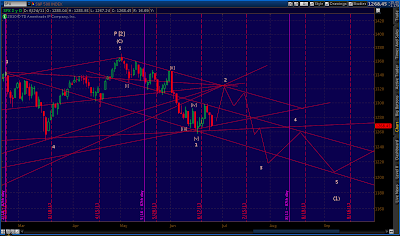 A move to 1322 would also be a 78.6% retrace of the 6/1 1345 high and a 50% retrace of the 5/2 1370 high. 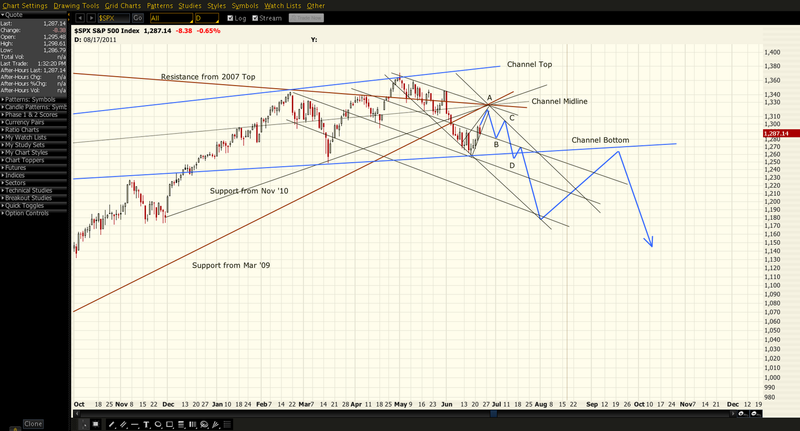 If it plays out as I expect, we'll have also completed a bearish bat pattern (since 6/1). The initial price target would be the .618 retracement, or 1297. And, a continued decline would complete a huge H&S pattern indicating downside below 1200. But, we'll deal with that in the coming days if the pattern develops as I suspect. The one thing this study doesn't spell out is whether 1258 was the low. This could be one of those 35-day patterns that loses 20%. But, I don't think so, but we'll know in the next few days. Just know that, if it is, we'll bounce back accordingly before diving straight for 666. Can we retrace 54 points in 5 days? Sure. We've had two 20-point days in the past 9 trading sessions. And, most technical indicators indicate we're somewhat oversold (more on that later.) The market seems very news-focused lately, so I suspect a positive trigger relating to Greece, the Fed, the debt ceiling or economic indicators expected out this week. Also, Friday is options expiration for the quarterlies, so keep an eye on OPEX related anomalies. I'll try to update the technical picture before the opening tomorrow. In the meantime, plenty to think about. Another great post. 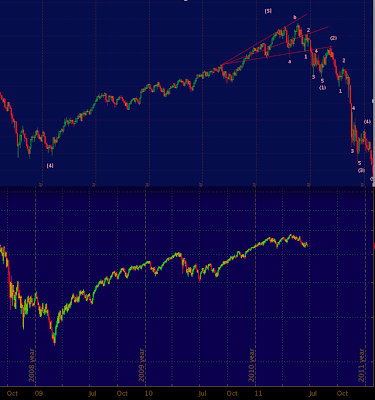 Btw, ES has hit its support trendline off the 3/09 lows for the fourth time. Given that AND 200DMA support, a bounce seems very likely. If we do break this support area, though, there should be a pretty sharp (albeit temporary) drop as stops are hit. Here is a chart. It would be interesting to compare the 1929 to 1933 stock chart compared to now. The market in the summer of 1930 looked absolutely brutal. 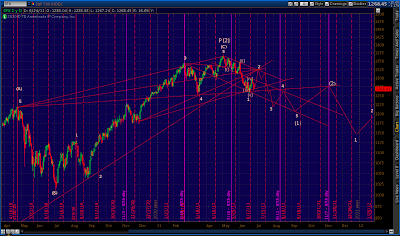 I think the market was on its way down in November 2010 before the Fed came in with QE2. They can distort market action for short periods of time, but the long trend will be down. It could be pretty scary trying to catch this knife. 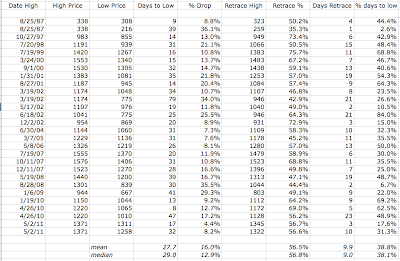 I actually dissect the 1929 - 1938 market, which is remarkably analogous to this and almost every other top I looked at. Note that, in the 5th chart down, that market returned to its midline just like all the rest I've studied. I agree re knife catching. Scary, indeed. 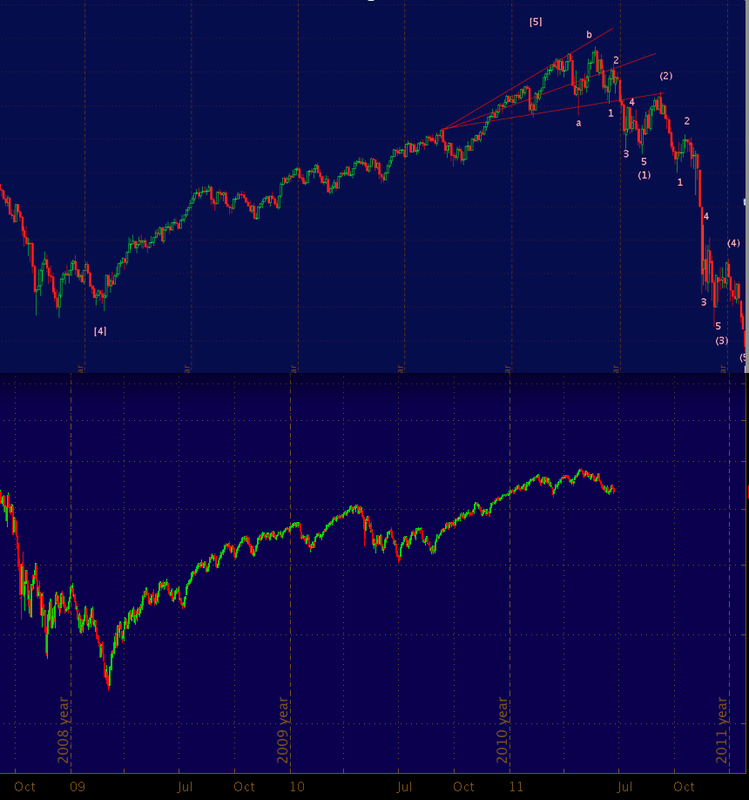 But, IMO, not as scary as going short here. And, please don't get me wrong. I'm not looking for a resumption of the bull market. I'm as bearish as anyone out there -- after a bounce. Just trying to put things into perspective from a historical standpoint. Spud, nice point. In addition to the 200 SMA, I'm watching the weekly SPX. MACD and histo negative, of course, but the STO is pretty oversold right now at 9.22. Haven't been that low since the selloff in June 2010.